I have suffered with acne for most of my 20s. You can check out a video I made on my acne coverage foundation routine, using drugstore products here. I’m going to do a ‘full story’ post soon, because things are actually a lot better now, and that’s due to a variety of reasons. But today I thought I’d talk about one of the products that has helped me immensely. My skin has been a bit of a mess ever since I made the disastrous decision to give the copper coil a go, and I developed acne for the first time in my life at the age of 23. Not fab. I got that horror removed in summer last year, and I’m still recovering from it. (Although I don’t want to put anybody off the copper coil… it was actually completely fine for me otherwise, and I would have absolutely kept it if I wasn’t one of the unlucky something small % who end up with copper toxicity). I have basically ended up having to completely cut down my skincare routine to a few key products, in an attempt to soothe things, and I’ve found a system which I feel works quite well for me, and keeps further breakouts at bay. I still seem to get some wonderful cystic areas, but there’s not a whole lot that can be done about those with products, and on the whole, things are basically otherwise under control at the moment! Most of the products I use are very natural, with my hero products being the Weleda Almond Soothing Facial Cream, which is, as the name suggests, very soothing, and the Weleda Aknedoron Purifying Lotion. The Almond cream is what I use as my main moisturiser, and it is extremely extremely gentle on the skin. Wonderful when your entire face hurts, and also great because it’s so gentle that it’s unlikely to break you out if you have sensitive skin. The Aknedoron lotion is becoming something of a cult classic, because it is just SO good. It basically sorts breakouts out, without the horrible drying peeling side effects of creams I’ve had from the dermatologist. Pop this on your trouble areas and I promise you the next day things will be looking a whole lot better. For my cleanser, at the moment I am using the Soap & Glory Ultimelt hot cloth cleanser which I did a full review on a while ago here but it is basically a poor man’s Liz Earle Cleanse and Polish (which I also love, and use when I can afford to stock up – review of that here). Then a couple of times a week I will pop on Lush Mask of Magnaminty, which is my favourite face mask of all time. I actually went for the full size tub the last time I bought it because I go through it like crazy. This bad boy will dry out breakups and leave skin feeling wonderful and smooth, and you can also scrub it to exfoliate as you’re washing it off! The great thing with this, is you can also use it on your body. I don’t wanna talk about backne, but it kinda does happen sometimes. Sob. The other day I was absolutely full of a cold (still am actually, how long will this plague drag on for?! ), and I didn’t quite dare wear my trusty winged eyeliner, because I knew I would probably end up with eyes so watery that it all came off in a panda-esque mess throughout the evening. So I thought I would try something fairly simple, and I went for this gold spring makeup look. I’ve been trying out a few new products lately, makeup wise. I’ll have some separate posts up soon on what new makeup products I’m loving and why, but let’s talk through the main products I used in this look. One thing that’s new in the makeup bag lately is the Bourjois Colorband eyeshadow stick in ‘Beige Minimaliste’, which is a lovely light gold. It claims to be waterproof, and 24 hour wear, and I honestly do find that it stays on very well. I love golds for my eyes, and I wore this with just a touch of ‘Smog’ from my Urban Decay Naked Palette in the crease (I’m still loving the original Naked 1, and you can tell that Smog is my favourite shade because I have well and truly hit pan on this one! ).I highlighted my brow bone and inner corner with the Bourjois Little Round Pot Eyeshadow in 08 which is a lovely champagne shade, and then finished off my eyes with a few layers of the Bourjois Volume 1 Seconde Waterproof – because waterpoofing was an essential that day! For my brows, I have been reaching for my Soap & Glory Brow Archery Pencil a lot recently, I have it in ‘Blondeshell’ and it’s the perfect shade for me. It’s difficult to find eyebrow pencils which are ashey enough for me, but this one is spot on. I hear this is a dupe for the much raved about Anastasia Beverly Hills Brow Wiz, which I haven’t tried, but I can confirm that this is a brilliant eyebrow staple. I thought I would make my lips the main point of focus, since the chances of me managing to sneeze off lipstick are slim to none, and finished off the look with my favourite Benefit Lipstick in the shade ‘Do Tell’, which is a gorgeous plummy purple. Quite an autumn lip colour I suppose, but I am fully prepared to work it in the spring! The low down on what I was wearing on my face will be coming soon, in a separate post, so stay tuned for that! I am pretty obsessed with golds and bronzes at the best of times, but Autumn/Fall really brings out my love of sparkly glittery things too, and that’s how I end up doing super glittery bronze/gold nails like these! I love them so much, and I just used a really cheap old Accessorize bronze glitter, and a little bit of a gold glitter I got from Claire’s over the top for a bit of dimension! Really really cheap and cheerful. And I always love how quickly a glitter nail dries, makes my late night nail painting sessions less nerve wracking (nobody likes getting nail polish smudges on white sheets). Obviously I said yes because Halloween is the most fun ever and I will take any excuse to play around with crazy makeup I would never normally get a chance to do. It was also a really fun project to be part of because they have been posting lots of other looks and nail art ideas from some really cool people and there is so much inspiration on there! Go take a look at the post I am featured in here, and be sure to have a look back at some of the previous posts too! My acne is currently the worst it’s been in almost a year, and I’m constantly battling trying to get it under control. This means I am being extra vigilant when it comes to things that could potentially make it worst, and number one on the list is hygiene! Cleaning brushes is a pain, and I always used to put it off a disgustingly long time and then have to deep clean ALL my brushes at once and have none to use while they dried. Now that I’m on a hygiene kick, I’ve actually been deep cleaning my main face brushes every day, and making sure I at least spot clean my eye brushes after each use. It’s actually not nearly as much of an ordeal if you keep on top of it, because you’re only having to clean the brushes you’ve used! I just clean my foundation and powder brush every night while I’m getting ready for bed, it doesn’t take long at all, and they are dry for morning when I want to use them again. 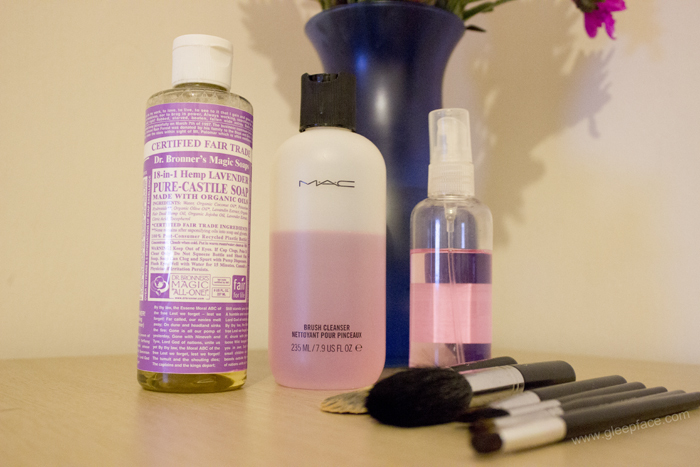 I use the MAC brush cleaner for spot cleaning my eyeshadow brushes, and I find that if I put it in a little spray bottle I waste far less product, and it lasts me longer, as well as being a bit easier to use. I just spray a bit onto a cotton pad or wad of tissue per brush, and give them a good wipe. The spray bottle was only a couple of pounds from Boots, and it makes all the difference to how long my brush cleaner lasts! For deep cleaning I use the Dr Bronner’s Magic Soap in Lavender because I LOVE the smell of this and I find it leaves my brushes really soft, as well as getting them cleaner than anything else I’ve tried! I used to use baby shampoo, but this is a lot more effective. I just put a few drops into my hand, wet my brush, and swirl it in the palm of my hand before giving it a good rinse. I repeat this until it rinses clear! Make sure you hold the brushes with the handles upwards, to avoid getting water into the metal bit and loosening the glue that holds the brush fibres in place! I actually found the Dr Bronner’s Magic Soap in TK Maxx for £3.99, but I think it’s usually around £5.50, which isn’t bad at all! What do you use to clean your brushes? 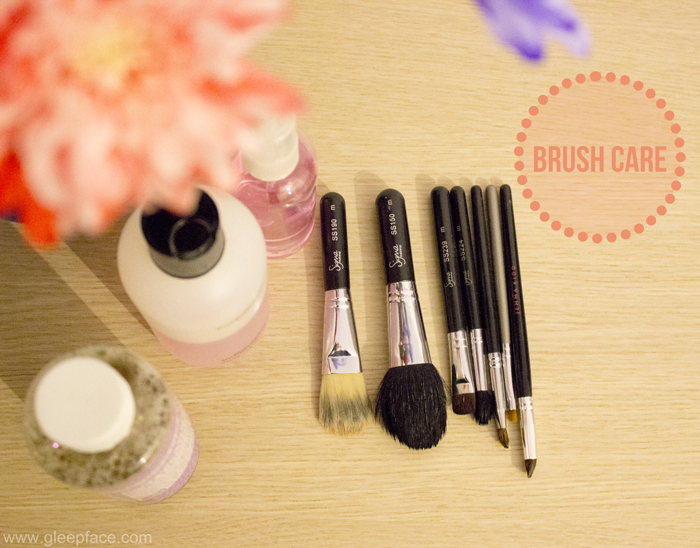 Do you have a brush cleaning routine? Hi guys! I just uploaded this Autumn inspired makeup look to my main channel. I really hope you guys like it. I totally ballsed up the eyeliner but I thought I would upload it anyway because you know, nobody’s perfect. I’m really enjoying doing these makeup looks and I’m so glad I started YouTube again. It helps bring me out of my comfort zone and my rut. I mean so far I’ve only posted quite neutral looks, but I am hoping to do a few more daring things soon too. I’m off to get my hair done and run some errands today, and I’ve decided to vlog! If I like what I see I will probably make it into a weekly vlog, and put it on my second channel. We shall see. Hey guys! I’m going to try to get into a regular posting schedule again, I’m having a bit of a think about exactly what type of content I want to be posting, and what I’m going to focus on more for my blog or my YouTube channels and there are going to be a few changes soon! For now here is my latest makeup look which has just gone live on my main channel, I really hope you like it. It’s my go to evening look of the past few months, and it’s super simple! I’m definitely enjoying Manicure Monday, it feels good to switch my nails up again. It used to be pretty much my favourite thing to do and I’m not even sure why I stopped! I’m still loving that it’s official Autumn/Fall and dark colours are allowed (although I am going to roll out the pastels a couple more times, I’m not ready to let go just yet). Purple is my favourite colour, and purple and gold is my favourite combo, so I am wearing China Glaze Spontaneous as the base, and then an old Accessorize gold glitter (which I really need to replace as it’s drying up) as an accent nail, and then Models Own Ibiza Mix and Mermaid Tears respectively on my thumb and ring fingers. Apart from it just being beautiful, I find it really amusing that there is a nail polish called Mermaid Tears.